Can anybody help me. I allowed Sonic Charge to send me emails but every time i try to open the patternarium,this window will be open..sry for my bad english..
Hi, Andy. You need to enable website storage in your Flash player. You can either do it in the global options or in site specific options. Did you enable website storage globally or just for our site? Sounds odd it only worked one time, once the setting is changed, it should allow us to save data. 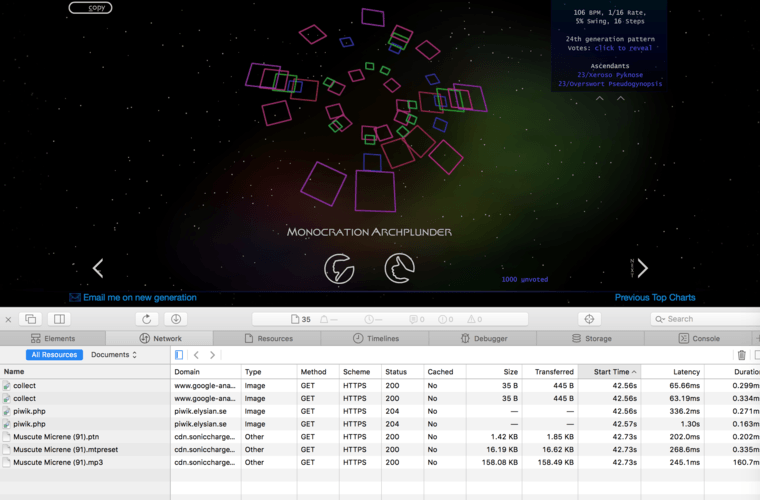 Do you by any chance have any plug-ins or blockers in Safari that could prevent Patternarium from saving data? Hey, does it load the flash player but not the patterns? 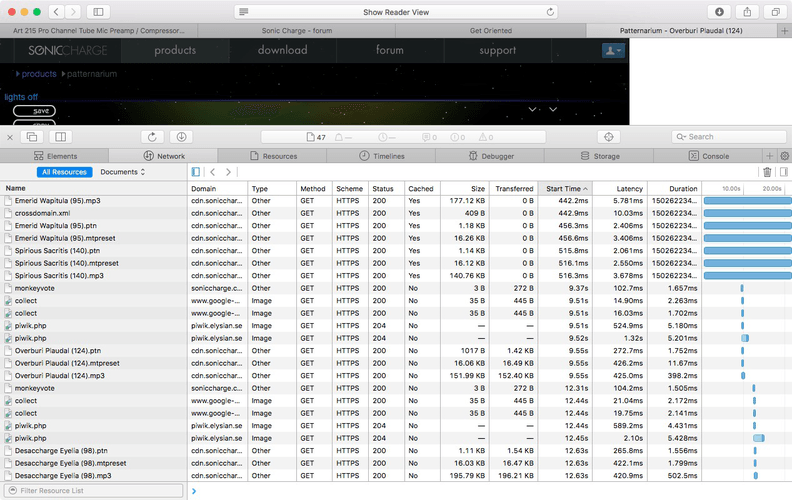 if you pull up the network tab in the Web Inspector in Safari. 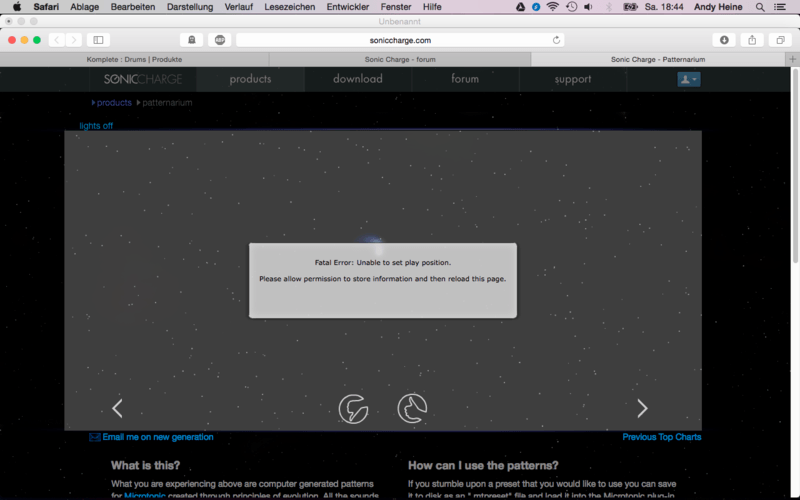 Then try browsing through the patterns and you should see your flash player trying to load the resources through your safari browser. You might get a hint there on why the resources do not load correctly. My process is to down vote with the "-" when I pass on a preset and let Patternarium cue the next pattern for playback. Then for ones I like, I hit "S" to save to an already-designated folder, Return to accept, then Shift+"=" for the plus symbol. Either the Save is still happening in the background, despite the save window clearing the screen and file being saved. But it's by the time I hit the "+" that the whole thing hangs, and the refresh hangs as well. I do not have an application shortcut assigned to the "+"
Odd. As you can see on the network inspector it loads the current pattern and then the next one as a pre-cache so skipping to the next goes faster. You can see by the names which one it loads. When you press the + and it hangs, does it load anything at that point? Save should be fast as the data is already loaded it just need to save it from memory. Have you narrowed it down to exactly when it happens? Like if you only browse with next, does it work? If you up or down vote only, does it work? Is it always after a save it hangs or after a number of saves? I'm encountering exactly the same problem as described by braduro. On Safari 10.1.2. with updated Flashplayer. Patternarium used to work perfectly on an older version of Safari (can't remember which, but maybe from six months ago). I believe the only thing that causes the freeze is the "save" procedure, no matter if I use a mouse click or the keyboard shortcut. Only thing that helps then is closing the tab and restarting Safari. I'm going to try above mentioned ideas and also if maybe the "copy" procedure works for me. Hey, I'm taking the opportunity: Your software is amazing!!! (I owe Microtonic, Permut8 and Echobode) - so inspiring and joyful to work with! To answer your question, the Patternarium hung just as soon as I pressed the return key on the Save window on the first save. It's hard to say, because it might have already been hanging by the time the pop-up window appeared. Other thing I can tell you is when I come back to the Patternarium after a restart or a month later, it'll typically include the file I just saved. So it's not registering my up/down vote before it hangs. Maybe it'll work now that the preset filetypes are recognized by my mac? Nope, just checked it again. It's otherwise still an issue. Same issue here, I'm only running the Microtonic demo at the moment but seems I can view the Patternarium without even logging in. Browsing the patterns works but as soon as one is saved, the page freezes, spinning beachball appears and never stops and I have to reload Safari to continue browsing the Patternarium. Looks like Safari hates Flash trying to save files to disk. 😢 Thankfully the copy function works.